A bit of color-exercising... Love love love the fishies!!! Worked some good amount of time on this, and will probably go back to it later to touch up here and there, but for now, I'm leaving it as it is. I want to swim when I look at this, haha. Ps. Thanks HUGELY much for all the comments and incredibly sweet words. I'm amazed by the attention this piece was given. More amazed when I saw how many comments you guys wrote, so I just wanted to make sure to thank you ALL so I don't miss anyone out, even if I don't respond to all the comments. Edit 2: What the... what the AAAAH? A Daily Deviation? I can't believe it!!!! OH MY GOD! I mean oh my goood! THANK YOU A THOUSAND TIMES: exillior, Rosella-of-Daventry, milyKnight, alicexz, MyLastBlkRose, vashael, Minato-Kushina and Cilitra for suggesting! And thank you Atramina so much for featuring this! Edit (again moahahaha! ): fixed anatomy and facial mistakes. =milyKnight said: "Color drops by *Viccolatte is pure beauty. Can't express my amazement in words...Simply stunning!". =alicexz said: "Stellar fantasy work from a very talented digital painter. The combination of color is just mindblowing, and the painting has such a wonderful, whimsical mood". =MyLastBlkRose said: "I am in complete awe when looking at this. The extreme detail and gorgeous colors make it almost 'Pop' out at you. Beautifully done". ~vashael said: "This is incredibly stunning. I love the colours, the flow and details in her hair and the beautiful fishes that surround her. It is absolutely mesmerizing and reminds me of all the wonders of the ocean". *Minato-Kushina said: "It attracts your attention with the first glance! 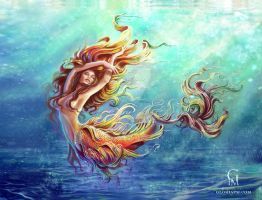 The colors that match each other so fine, the expressive pose of the mermaid, as well as all the exotic fishes, they all give to this detailed painting a brilliant touch, you feel like you are indeed underwater. Absolutely check the rest of this beautiful gallery!". Love, love, love this piece. The colors are amazing. Beautiful! You definitively know how to match colors !! Really nice !!!! Aw thanks so much for such a kind comment! I'm loving the textures in this piece. The colors are beautiful together, and the painting technique is remarkable. Wonderful work! This use of color is mind-blowing! Beautiful! it is amazing and you deserve the dd! I apologize to you because I took this photo to edit and do one so-called PSD. Expect you to forgive me. Lovely! What species of fish are they? amazing use of color patterns. I also like the way u drew the hair! Thanks hehe It was a fun one, altho it took me aaages.. I love the way you drew her hair! I can see every strand! A banquet of color. Thank you for creating this. This is just fantastical, I love this sort of brilliant idea, but the colors, my god, are perfect. Good variety of brushes, this is a masterpiece. Yeah at the time this truly was my best piece yet Thanks for the lovely comment HeartyStar! unbelievable! absolutely unbelievably gorgeous !!! Oh! Eu adoro os peixes! THIS IS AWESSOMEEE AND YOU'RE JUST EPIC ;^; !